Figure 1: The back teeth and the front teeth work in harmony. The back teeth support facial height and chew food while the front teeth cut food, protect the back teeth in lateral jaw movements and provide your smile. 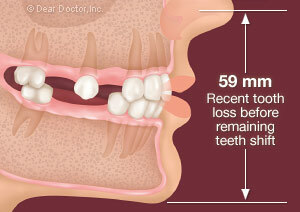 Figure 2: The loss of the back teeth place excessive pressure on the front teeth causing subtle shifting of teeth and slight loss of facial height. Figure 3: Without replacement of the back teeth, the teeth start to shift and excessive pressure causes the front teeth to spread forward. Loss of facial height occurs. We tend to think about teeth as individual units, your dentist even gives each tooth a name and number, but in fact they make up a complete system, each one adding to its neighbor to function as one. Think about how the keystone in an arch holds all the other stones or bricks in place. For purposes of description we can think about the human dentition (full complement of teeth) as being composed of the anterior (front teeth) and posterior (back) teeth. The anterior teeth (the canines and incisors) are used for cutting and tearing food, and the posterior teeth (the premolars and molars) are used for grinding and chewing [Figure 1]. Importantly, the posterior teeth also support the vertical height of the face. If they are lost, the face tends to lose height and close down; this is called “posterior bite collapse” [Figure 2]. Unlike implants, teeth move; not only do changes occur to the remaining back teeth affecting their spacing and biting function, these changes also put pressure on the front teeth which tend to move or splay forward [Figure 3]. All of these changes have implications for normal form (aesthetics) and function (bite). They also have ramifications for other facial and jaw structures which can affect anything from the skin to muscles and jaw joints. 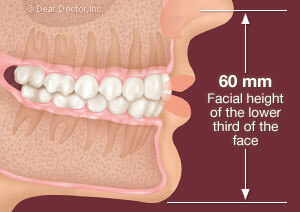 Appearance begins to change as the height of the jaw decreases, wrinkles increase and the corners of the mouth droop. Additionally, it can become difficult to eat food because the front teeth were not designed for chewing. This is to say nothing of the social consequences of tooth loss; smiling, talking, singing, laughing and enjoying a nutritionally sound diet — all leading to both poor general and mental health. Dental implants are a relative “new kid on the block” for replacing missing teeth, but how do they really compare to other more traditional systems? Removable options — Past methods of removable tooth replacement have included plastic “flippers” (non-precision, simple, temporary in nature and relatively inexpensive) and precision made metal based partial dentures, which are more expensive. Both can replace individual or groups of teeth. A fundamental problem with removable prostheses (replacements) is that for stability they rest on the teeth and gums tending to cause further problems all related inevitably to their design. These include tooth decay and periodontal (gum) disease and hastening the loss of bone and teeth through pressure transmitted through the gums upon which they rest. They constitute short term options with documented studies indicating that removable partial dentures are replaced about every 5 years. For total tooth replacement whether in the upper or lower jaw full dentures (plates) have been the only option. Since they are kept in only by pressing on the gum tissues they transmit force to the underlying bone which accelerates its loss even more quickly. They also compromise the facial structures. As they continue to collapse, full dentures must be relined (made thicker) to compensate for additional bone loss and facial sagging. They also become particularly problematic in the lower jaw where there is no palate for suction and in addition tongue forces tend to destabilize them. Non-removable options — Fixed bridges are non-removable prostheses (tooth replacements) which are attached to the natural teeth. They act by joining other teeth together with a false tooth or teeth between them “bridging” the gap. But the biggest disadvantage; these “abutment” or adjoining teeth are cut down into small peg shapes which compromises their long term health. As well as carrying the additional load of the missing teeth they replace, they become more prone to bacterial plaque accumulation, decay, root canal problems and periodontal (gum) disease. Bridges do not have a long life span therefore they will eventually need to be replaced. Studies indicate that bridges are only 67% successful at 15 years.